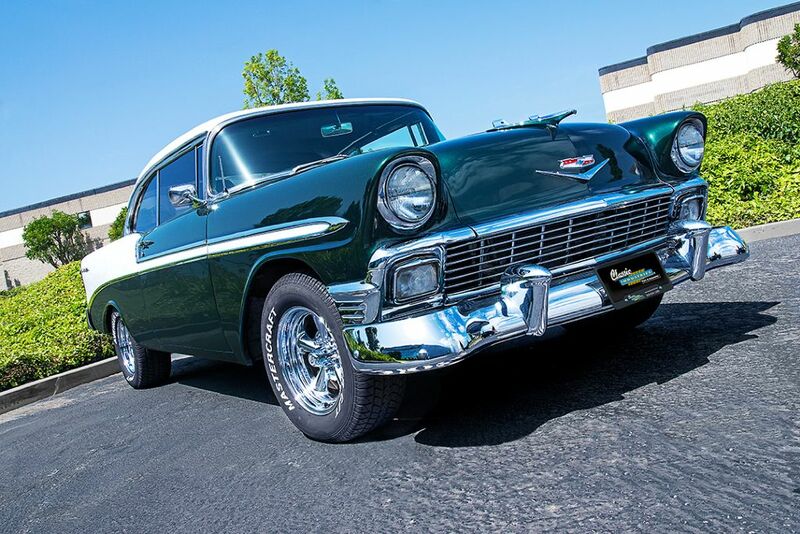 With a classic two-tone paint scheme and chrome gleaming in the sun, this Tri-Five is one cool daily driver. Although there's nothing wrong with leaving your restoration project in the hands of qualified professionals at a trusted shop, there's something truly special about doing all the labor yourself. After countless hours of turning wrenches, and many late nights in the garage, you end up having personal knowledge of every last nut and bolt on your car. This was the case for Larry Richards, of Seal Beach, California, who recently stopped by the Classic Industries showroom with his 1956 Chevy Bel Air. Larry restored this classic Chevy himself over the last five years, with some assistance from his friends on occasion. It features a 383ci stroker small-block V8 paired with a 700R4 automatic transmission. Disc brakes are visible through the windows of its chrome American Racing five-spoke wheels. We appreciate its vintage green and white two-tone paint, and abundance of intricately polished chrome accents.